Pedestrian deaths rose 15 percent in Boston in 2016. Nine pedestrians have died this year, up 30 percent from this time last year. In addition to these deaths, 384 pedestrians were hit and required medical attention during the first half of 2017. The news station also reported that some Boston residents are taking charge and raising funds to build crosswalks. This is not cheap. In the South End, Tremont Street residents are trying to raise $25,000 for crosswalks at the intersection of Tremont and Union Park and Upton and Columbus and Rutland. As pedestrian fatalities have risen, the City of Boston’s Vision Zero Task Force has been working to make the city safer for pedestrians and cyclists. The task force’s goal is similar to Vision Zero task forces in other major cities – to eliminate transportation deaths by 2030. The rise in pedestrian deaths is discouraging, especially since the task force was recently successful in lowering default speed limits in Boston. Lower speeds mean fewer accidents because drivers have more time to respond. The task force had to obtain Legislature approval to lower the city’s default speed limit from 30 mph to 25 mph. Now all cities in Massachusetts can opt-in and lower speed limits if they choose. A number of communities already have, including Cambridge, Somerville, Quincy and Milton. At Breakstone, White & Gluck, our Boston pedestrian accident lawyers have over 30 years of representing those who have been injured and killed by negligence in Massachusetts. Our attorneys have represented numerous families who have lost loved ones in pedestrian accidents, even in the crosswalk where they should have been safe. In 2005, one of our clients was struck by an MBTA bus right in a crosswalk on Washington Street in the South End of Boston. Boston has some of the most congested roads in Massachusetts and many have been taken over by construction over the past few years. Drivers need to take even more care when traveling in the city and watch out for pedestrians and cyclists. Yet they often don’t and the roads tend to be more congested this time of year in Boston and Cambridge, as college students move in and elementary schools re-open. Walk down any city street and chances are, you will see someone sitting in a car at a traffic light or stopped in traffic, ear to cell phone. In-vehicle devices which allow hands-free talking or map out directions are not always safer, either. When it comes to intersections or at parking garages, shopping plazas or schools, drivers need to give the road their full attention – and slow down. 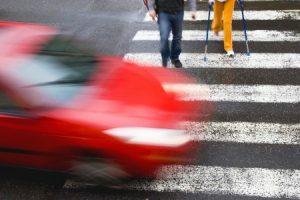 If you or a loved one has been injured in a Boston pedestrian accident, you may have the right to seek compensation from the responsible driver. Contact us for a free legal consultation at 800-379-1244 or 617-723-7676 or use our contact form. You can also read about Breakstone, White & Gluck’s recent settlements and awards for clients in pedestrian cases.